The Scent a Celebrity Series is my vain attempt at picking perfumes for those who don’t know any better, yes I mean celebrities. Let’s face it, most celebrities are incapable of choosing decent clothing, boyfriends, girlfriends, movies, (insert-celebrity-mistake-here) let alone having the ability to make decisions about something as important as their scent – that’s where I come in. Never fear my dear schlebs, I will ensure that you are appropriately scented, all you need to do is listen. Now, if you haven’t been living under a rather heavy rock over the last week or so, you will be aware that there has been a big wedding in the world of celebrities. A wedding that is likely to make the big shindig our dear Wills and Kate threw a few years back, pale in comparison. I am of course referring to the nuptials of Kanye West, raps biggest and most talented ego, and Kim Kardashian, reality star and super-astute businesswoman. To celebrate the joining of these two souls in holy matrimony, I would like the opportunity to pick out some perfumes that I think would have made good candidates as Yeezy and Kim K’s wedding scents. These fragrances need to match the ostentation and ridiculousness of what I’m sure will have been a lavish wedding unlike no other, but they also need to compliment these two incredibly unique characters. Kanye West is a man that believes his own hype. He’d be the first to admit how insanely talented he is and unlike most self-loving celebrities, he does in fact possess the goods required to justify his inflated sense of self. I find his belief in himself quite refreshing and his famous rants are more than just a tad amusing. So yes, our dear Kanye may come across as a bit of an eejit at times, but as far as his work goes, he is most certainly worthyof the hype. But what scent would Mr. West wear on his wedding day? Rumour has it (i.e. the interwebz told me) that the fashion-loving rap star rocked a Givenchy tuxedo and I’m sure that he looked very dapper indeed. As a purveyor of designer brands, I envisage Kanye to have worn a perfume from a renegade couturier to match the suave sophistication of his sartorial choices. 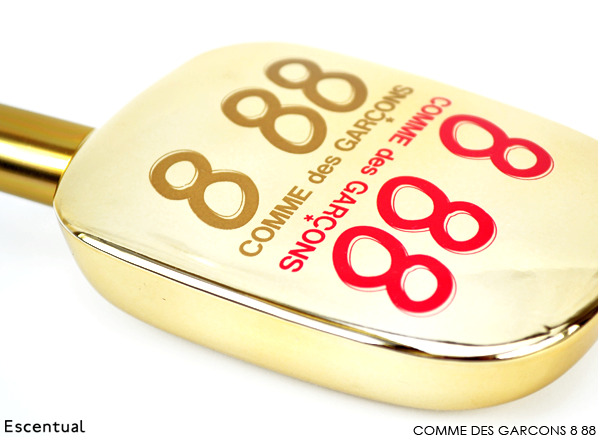 Comme des Garçons is one such house and their olfactory ode to the scent of pure gold – 8 88 – would make a perfect wedding perfume for this most royal of rappers. 8 88 opens with a big blast of saffron and aldehydes that smell strangely metallic and warm, before settling to a handsome dry down of patchouli and amber. 8 88 is a showy perfume and Kanye West is a showy kind-of-guy, and on this most showy of days, it would have made for a rather excellent olfactory accompaniment to the world’s showiest groom. Where to start with our dear Kim K? Love her or hate her, it’s difficult to deny that she is a tour de force within the wealthy world of celebrity. Famous for all sorts of things, many of which don’t involve the greatest levels of talent, Kim has turned the Kardashian name into a brand with immense power. Did I mention that she’s quite stunning, too? So yes, whether one is a fan or not (or is simply ambivalent), there is no denying the power of Kim K.
But what perfume would she wear on her big day? We know for a fact that whatever she does – the dress, the venue and the cake – will not be done on the quiet and will in fact be a visual spectacle, and her fragrance needs to match. In reality, one imagines that for promotional purposes, the new Mrs. West would have worn her very own celebrity fragrance, ‘Kim Kardashian’, which is actually a competently put together white floral. But, I would be cheating if I picked that now, wouldn’t I? In keeping with her obvious love of white flowers, I would scent Kim with a beautifully understated (because the girl needs a lesson in the art of subtlety) take on the gardenia flower from Van Cleef & Arpels’ Collection Extraordinaire. 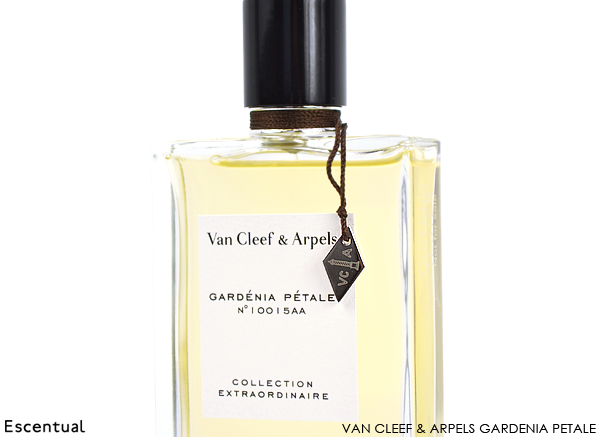 The perfume is called Gardenia Petale and pairs the elusive mushroom-y and blue cheese-esque tones of gardenia blooms with the sweetness of tuberose and the plush feel of sandalwood. Gardenia Petale is a perfume that feels completely and utterly bridal, almost as if it is crafted out of yards and yards of pure white lace. It’s also quite ‘big’ in the sense that it gives the impression of voluptuous curves and fluffy meringue-like wedding gowns. Much like our dear Kim, it’s a striking thing to behold. What wedding scents would you have picked for Kanye West and Kim Kardashian? This entry was posted on Wednesday, May 28th, 2014 at 9:47 am and is filed under Candy Perfume Boy, Fragrance, Uncategorized. You can follow any responses to this entry through the RSS 2.0 feed. You can skip to the end and leave a response. Pinging is currently not allowed.